The Fall 2014 reviews begin today with one of the first series to feature on the calendar. The world that humanity once called home is looking to broaden its reach to its nearest habitable world, Mars. In the late twenty-first century, man sent samples of algae and cockroaches [one of the hardiest creatures on Earth] to Mars in a hopes that these could terraform the planet [generate air and plant-life] so humans can move in the future. Five hundred years later, this mission has worked. Sort of. The mission’s head didn’t anticipate the cockroaches transforming into super-strong humanoid cockroaches that can break a man in half as if it were rice paper. Terraformars is about humanity claiming back the world of Mars with tons of blood and guts…if you could actually see them! The show takes place in the early twenty-seventh century when a young man named Akari is the subject of great interest of the United Space Agency (U-NASA) after his wife is the victim of a new virus which is believed to have originated from space. This strain of disease has the potential to wipe out humanity and the team have no leads; except one. That planet that they tried to colonise centuries ago…what was it called again? MARS. This is what you get when you play god! In an attempt to not only gain a foothold in the fight against this new virus but to eliminate the threat that destroyed two previous expeditions, Akari and dozens of other recruits are offered special treatment to prepare them for combat and Martian life. 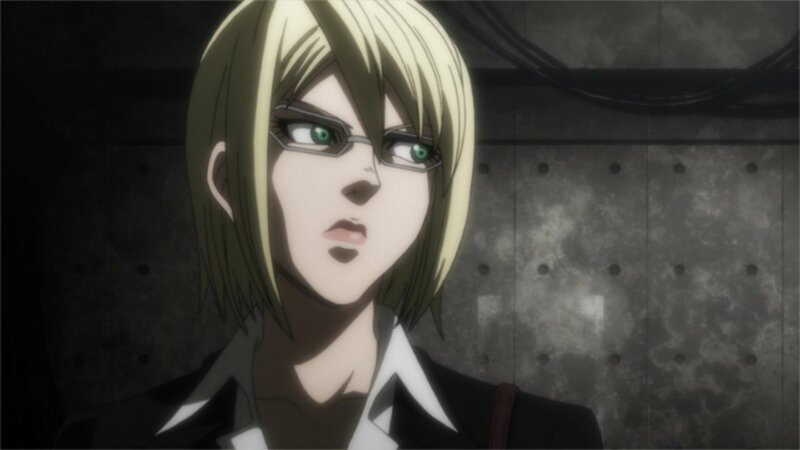 Led by the survivors of the previous mission, BUGS 2, the team of Annex I aim to eradicate the threat of the Terraformars and discover an antidote for the biological threat that is looming closer. This sounds like a pretty threatening premise…if you weren’t thwarted by black bars which take up most of the screen. I’m going to go onto this very quickly because this problem is a HUGE one. Black bars. Censorship in anime these days is fairly common when you have more risque and violent series; you usually find it done very cleverly or subtly (i.e. as rays of sunlight next to a window or dark shadows in a dingy room). Recent laws have required this to happen and most creators have adapted smoothly, or as smoothly as they can. Terraformars doesn’t do that. All of the blood, all of the shock, all of the immersion is ruined when you are greeted with censor bars which, at times, take up eighty percent of the viewable space. Some move jerkily around if gory material is being shaken about; or heads are blacked out if they’ve been crushed. I have never seen censorship in a mainstream anime go this far; it’s ridiculous and unnecessary. It is also cheap – a blatant tactic on the part of Liden Films (the makers of the show) to generate sales of the uncensored Blu-ray and DVD release in the months ahead. You might think that because the content is so violent and that this is going out on Japanese TV that you would need to adhere to this kind of censorship; I don’t agree. For starters, the show goes out at 12.30am. This is at a time where any kind of watershed will be long expired. Also, there’s the fact that another equally gory anime, Parasyte, is airing with very little or NO censorship whatsoever AT 1.30AM! If this was a consensus amongst all broadcasters, both anime would be equally censored; but it’s not. Instead, we have an anime which is compromised. Extremely. So what do we have when things aren’t censored? Well, we have a bit of a narrative mess, especially at the beginning. The first two episodes covering the initial recruitment of the characters, including Akari, is in actuality covering the first TWO VOLUMES of the manga. The writers have compressed three hundred pages of content into forty-five minutes of screen time. As a consequence, the plot is severely rushed and stripped clean. The first episode especially left me confused as most of it involved Akari fighting a bear in some kind of freak show for rich people. I had no idea what was going on. Presentation-wise, it’s a little pretentious. 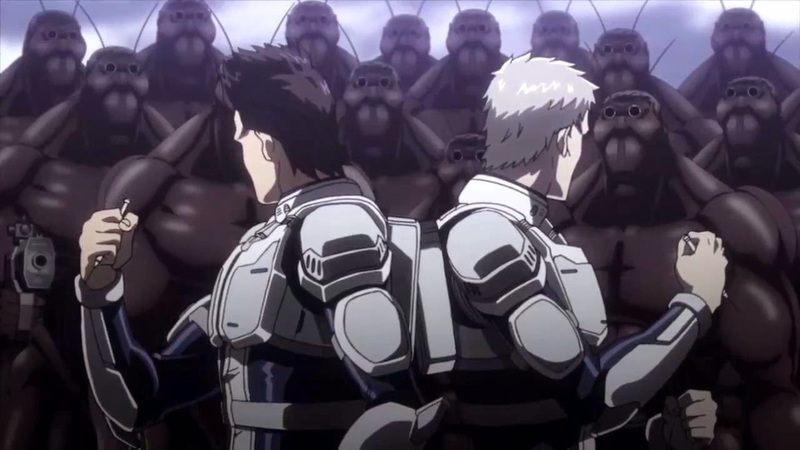 Jaunty angles and epic camera pans are thrusting the idea that Terraformars is another Attack on Titan. How? The epic camera swooshes, the overpowered Akari and executive officers being the only hope, the RIDICULOUSLY strong Terraformars themselves and humanity being under threat by them. This show wants to be the latter but it fails because it’s mostly dull; characters talking about corruption and sundry matters. The genre is meant to be action, so make it action-packed more often. The Terraformars though are pretty menacing. For the first couple of episodes, they are portrayed as silent and brutal killers with no idea of emotion. Hyper intelligent, fast, strong and scary. Sounds like a perfect monster; you’re left wondering about how you can tackle a being like that. Well, you have to make a medicine to help level the playing field; but they’re onto that. 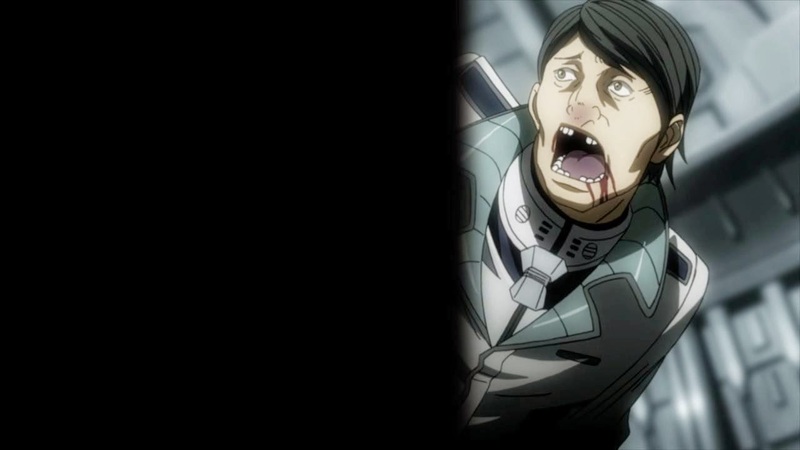 Episode two has a moment which made me perk up and upped the stakes tremendously regarding the Terraformars. When they opened their mouths though and yelled, it sort of diminished their fear factor but they are still frightening; you wouldn’t want to meet one in a dark alley…or anywhere for that matter. The way they are presented, including the animation itself is respectable, if a little stiff. There are grand shots, mass action and detailed backdrops; but the animation of the characters is a little lacking and lazy. One example is one scene when the executive officers are fighting the monsters and then we cut to another scene; we return and the Terraformars are dead, most of them killed off screen. Great. Are we supposed to be impressed by IMPLIED strength? Maybe, but I want to see bugs being smashed; especially since we don’t see anything else remotely gory. 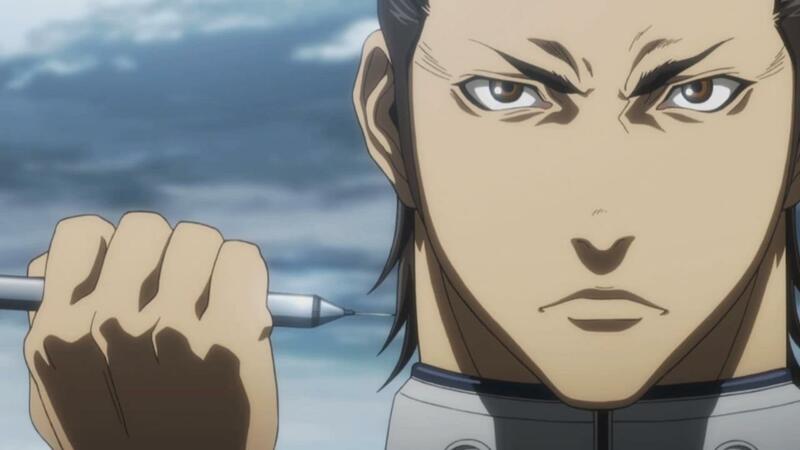 I think Terraformars has potential to be pretty good in terms of pure action. One of those sci-fi properties like the original Total Recall or Alien where there’s tons of over-the-top action and bags of character. However, I cannot excuse the censorship rife in this show. It taints the show for me and I cannot recommend the show because of it. Crunchyroll has recently announced that, for one day only, they would stream the first three episodes uncensored; probably as a response to the mass criticism or merely as another marketing exercise. It’s hard to tell but all this hiding behind black bars has overshadowed this anime entirely. TERRAFORMARS is available to stream on Crunchyroll. If you like what you read, please visit my Patreon campaign to help grow Anifile. Inspired by the works of BennettTheSage, Anifile has a brand new show entitled Bad Fanfiction Theatre. Join Mr Gamington-Smythe as he dramatically reads the finest fanfiction the internet has to offer. Today, Ms Destiny Nyugen finds herself in a most heinous love triangle involving characters from two of the most ‘beloved’ teenage paranormal romances. Phyllida, Jayson C, Brian E, Darren180223, Luis V, David D, Mahan, James H, Dawn S, Carson C, Eric W, Brandon W, Alexander W, Jack, Brandon B, Eclipse, Jamie D, Griffin, Teitur, Bryce S, Michael S, Matthew D, Charles G, Jonathan K, Henry H, Jack0, Jayro Z, Tim M, Joshua R, Benjamin M-D, Lightuke, Alesha F, Alexander S, Jack D, D’Metrius S, Anthony C, Veronica B, Vaatiwithblue, Malcolm T, Furst, Alexander and Sean! Inspired by the works of BennettTheSage, Anifile has a brand new show entitled Bad Fanfiction Theatre. Join Mr Gamington-Smythe as he dramatically reads the finest fanfiction the internet has to offer. Today, friendship is not magic…it is only danger! Watch Rainbow Dash lead a team to save Appl-y-jack! Inspired by the works of BennettTheSage, Anifile has a brand new show entitled Bad Fanfiction Theatre. Join Mr Gamington-Smythe as he dramatically reads the finest fanfiction the internet has to offer. Today Sonic and crew have to fight Eggman with a team of unusual allies – from Yu-Gi-Oh to My Little Pony!